Non-flowering plants are those that do not ever produce flowers. Some non-flowering plants, called gymnosperms, still produce seeds while others use spores for reproduction. Gymnosperms are any type of vascular plant that reproduce via an exposed seed. While most flowering plants, known as angiosperms, have a seed enclosed in an ovary or fruit, gymnosperms (which means "naked seeds") do not have covers on their seeds. Found all over the world, conifers are largely woody plants, with trees making up the vast majority of conifers. They bear male and female cones that pollinate and spread. Ancient plants dating to the Jurassic era, cycads are primarily found today in tropical or subtropical climates. Cycads are characterized by having thick trunks and large divided leaves; they have visual similarities to palms and tree-ferns. Commonly known as the maidenhair tree, Gingko Biloba, is the only remaining species of the Ginkgophyta plant division. While they only grow in the wild in China, they have been cultivated around the world. They have green fan-shaped notched leaves that yellow in cooler weather. The male trees produce tiny cones that produce pollen; the females, once pollinated and fertilized, produce seeds with a noxious odor. This plant division is fairly broad, including approximately 70 species, all of which have vessel elements transporting water within the plants. Examples of gentophyte non-flowering plants are Ephedra, Gentum and Welwitschia. Spores are tiny living cells which leave the plant on which they originate and are pollinated and fertilized away from the original organism. Very common plants, ferns are vascular plants that have a stem, leaf and root. 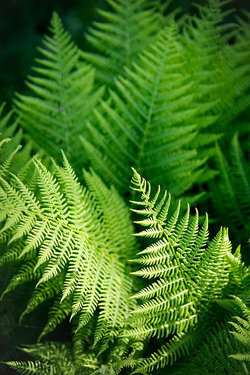 Ferns can be found in forests, but also are cultivated to improve the quality of soil or to improve air quality. They are also used ornamentally in landscaping as well as inside homes and some people even eat the plant. They produce spores which develop into a photosynthetic structure called a prothallus; the underside of the prothallus has organs that produce sperm and eggs that allow the ferns to self-fertilize, at which point a sporophyte develops and grows into a fern. With approximately 12,000 species, mosses are very prevalent and grow in moist areas with low light. Also known as Whisk Ferns, the Psilotales are a small group of plants, including Psilotum and Tmesipteris, believed to date from the Devonian era. These small plants are like mosses but they have flattened bodies or stems and grow on rocks or the ground. Some even grow in pools of water. There are over 8,500 species worldwide, often in moist areas, though there are some outliers that live in drier climates. Tropical mountains are the primary home of the club mosses, but they can be found in northern forests as well. These mosses are evergreens, with leaves that are needlelike and clustered. Found in damp environments, hornworts are known to grow anywhere from the backs of trees to gardens and fields. They are small and short and are sometimes considered weeds. They were previously a part of the same grouping as mosses and liverworts. Equisetum is the only genus of this non-flowering plant that is not extinct. With small leaves around the stem, these plants grow anywhere from 7 inches to 26 feet tall, depending on species. These examples of non-flowering plants include those that reproduce with uncovered seeds and those that reproduce with spores. "Examples of Non-Flowering Plants." YourDictionary, n.d. Web. 23 April 2019. <https://examples.yourdictionary.com/examples-of-non-flowering-plants.html>.